D-Log: It's a Birthday... or 2! It's a Birthday... or 2! Today, I turn 42 at around 2pm! It's a wonderful thing to reach this point in life and be content with what I am and what I have. Sol's birthday was on the 12th. Since we have been very busy lately Since we are always busy, we decided to have a double celebration today. The kids have been very excited planning where to go for dinner and what to wear. 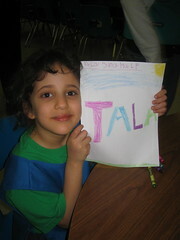 On February 23rd, we celebrated Tala's 5 and a half birthday. Her birthday is August 26th. 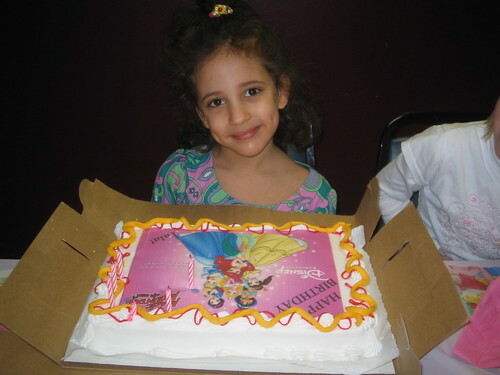 It's always before school starts and she never had a birthday party with all her friends. Last year, we delayed the party till mid September, but it was still early in the school year to know her classmates. I promised her this year to have one at her half birthday, and we did. She and her friends had lots of fun at Magic Mountain. She kept saying "This is the best day ever!" Here's how she writes her age: Five ina half. She wrote this on a drawing she made of her name at the Daisy Doings event. The drawing would be given to people who cannot leave their homes. Daisy scouts have been meeting regularly and will continue through first grade. Tala has earned the center of her daisy and 3 petals so far. She is enjoying it. 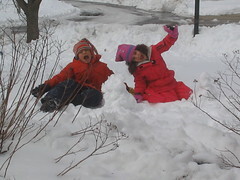 The weekend of March 8, we were buried in 20+ inches of snow. The blizzard broke the record of February 1910. It was nice to be locked in for the weekend, not by choice but still nice. 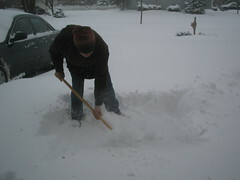 Except for Sol who had to shovel the snow for more than 4 hours! Every winter seems colder and colder and global warming is the scare! Following the blizzard, Jeanne got sick with strep throat and pneumonia. Luckily, it was the end of the Quarter at OSU, and Sol was able to fill in for her for a week. 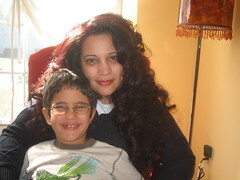 He had good times with Tala in the mornings. 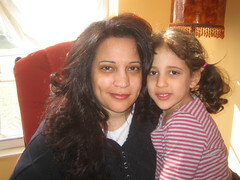 Tala kept saying how much she missed Jeanne. Once, Jeanne came back, Tala said to Sol, "Now that Jeanne is back and things are normal again, I miss you!" On March 2, Hillary and Obama were both campaigning in Westerville. Hillary was in Westerville North High School (down the road from us), and Obama at Westerville Central. I took the kids and went to see Hillary. 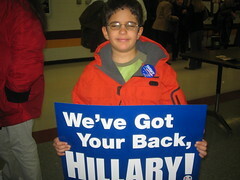 Tala wrote a sign in pencil saying "Hillary Clinton you go girl". She kept waving it and shouting with the crowd cheering Hillary on. When the rally was over I saw 4 Somali young women walking out of the stadium; 2 with complete khemar and 2 with hijab and clothes sweeping the floor as they walk. It was odd and such a contrast! It brings many thoughts to mind... I won't get into that now. February 18 was the Cub Scout banquet. 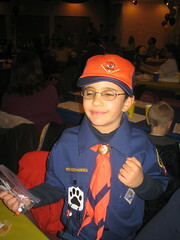 Moody earned his Tiger badge along with many beads and loops. Again, they held it on a Monday; and it extended late for a school night. On March 14, Moody lost his seventh tooth and Shamsa paid us a visit with her fairy dust. I keep telling the kids, Shamsa is clumsy! She leaves her dust every where. Tala links losing teeth to being in first grade. She's very anxious to lose a tooth and get a special visit from Shamsa. That captures it all--in a disorderly manner... Just like life! Now we're caught up and hope to continue blogging/scrapping more frequently. The other day, I was looking for books to buy for the kids. I remembered an interview on NPR's All things Considered with Berkeley Breathed about his book Mars Needs Moms. It was fitting for the week being it's Mother's Day and my birthday. If you know kids who think their mom is a slave-driver and a carrot-cuddling cuckoo get them the book before they lose their mom to Martians. I also ordered Fancy Nancy for fancy Tala after hearing the interview on NPR's Morning Edition with author Jane O'Connor. It's very funny and entertaining. Nancy made her family dress up fancy for a night out. It reminded me of Tala wanting to dress up fancy when we go out for dinner. Moody does that too. Fancy Nancy is illustrated by Robin Preiss Glasse, same illustrator of Garrison Keillor's Daddy's Girl. Fancy Nancy, and Daddy's Girl, are must-haves for any princess. Happy birthday, Hannu! I just heard on the way home that today is also the birthday of Chaka Khan! So here's Chaka doing A Night in Tunisia.